Shine Dental Care constantly welcomes new patients from Worksop. 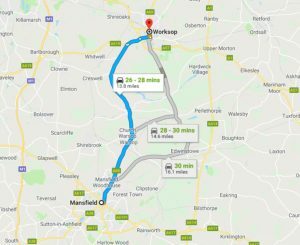 A half-hour drive down the A60, our Worksop patients continue to visit our leading cosmetic dental clinic in Mansfield. There’s plenty of free parking and our dental practice is incredibly easy to find. Our experienced team of implant dentists have access to the latest dental implant technology that helps us deliver effective and long-lasting results. If you’re visiting us from Worksop, you can design and plan your dental implant treatment right in our Mansfield cosmetic dental clinic. Why do new patients from Worksop travel to visit us? Shine Dental specialises in dental implants. We are well known across all of Nottinghamshire and South Yorkshire as the dentist other dentists refer to. The standard of our dental care and the scope of the implant work we can do often surpass what are available locally to patients. Price: Shine Dental regularly compare our treatment prices with other similar dentists in the Sheffield, Chesterfield and Lincoln area. Our fees are highly competitive. Can I have implants? One of the reasons patients travel to Shine from Yorkshire and all over the North is that we have a reputation for complete transparency. If we do not think you are a perfect fit for implants we will say. We assess all patients for suitability before undergoing any treatment.